Composing over 150 works for piano and voice over a period of 44 years, the songs of Francis Poulenc remain consistently popular to concert audiences the world over. 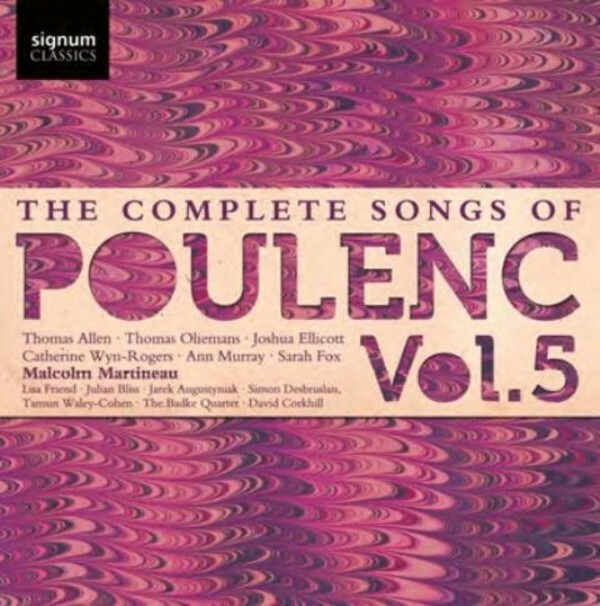 Varying in their individual style and character in a way that defies generalization, Poulenc set music to a wide range of different French poetry � both ancient and modern, and from the serious to the surreal. The final disc in Signum's series of 'The Complete Songs of Francis Poulenc' features a cast of the finest singers of our generation, accompanied by Malcolm Martineau as well as additional instrumental soloists for Poulenc's larger-ensemble settings of his songs.